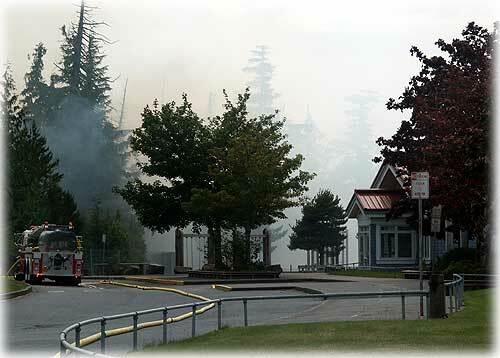 Ketchikan, Alaska - With sirens screaming down North Tongass highway, firefighters from three local fire departments and the United States Forest Service responded quickly to a brush fire that reportedly began near the west end of North Point Higgins Elementary School around 4 pm Thursday. 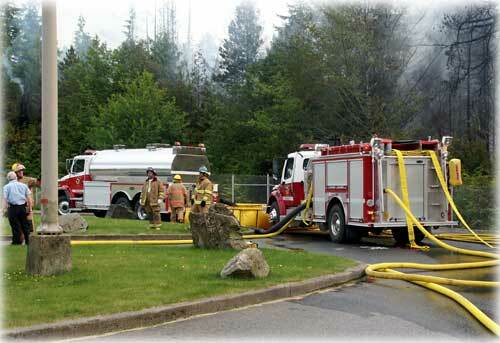 With Ketchikan experiencing very dry conditions and afternoon winds, the fire quickly spread from the west to the east running a line behind the North Point Higgins' parking lot toward two water cisterns that supply water to the elementary school. First on the scene was the North Tongass Volunteer Fire Department responding with a fire engine, three water tankers and most of their volunteer fire department personnel. 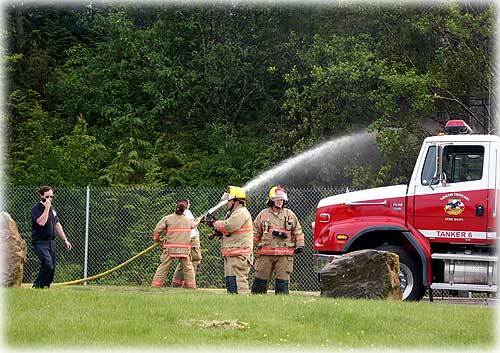 Also responding to fight the spreading brush fire were the South Tongass Volunteer Fire Department (STVFD) and the City of Ketchikan Fire Department. 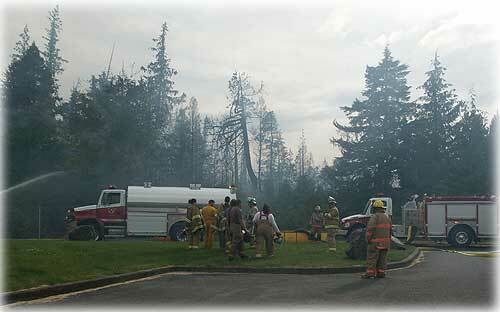 NTVFD Chief Dave Hull said Ketchikan's local fire departments are trained to fight building fires not forest fires. Forest Service firefighters are the experts in this area and while awaiting the arrival of the Forest Service firefighters, local firefighters sprayed water in the burning brush. 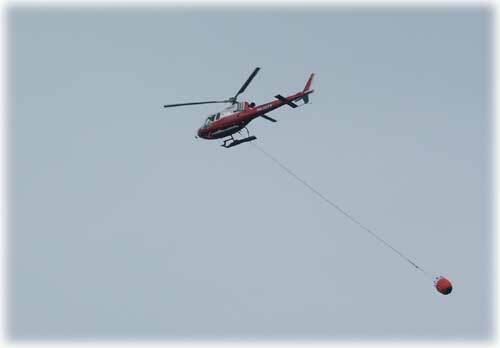 In fighting the brush fire, the United States Forest Service dispatched two helicopters with water buckets to drop water on the hot spots. The Forest Service firefighters with the help of the firefighters from the three local fire departments had the fire contained by approximately 6:30 pm. According to Chief Hull, the crews expected to be working most of Thursday night monitoring the burned area and watering down any hot coals. With a light rain beginning to fall around 8 pm Thursday evening, Mother Nature also reported for duty. There were no injuries and no damage to buildings or homes thanks to the quick response of the firefighters. The cause of the blaze is still under investigation. In addition to the elementary school in the area of the brush fire, the neighborhood is densely populated. 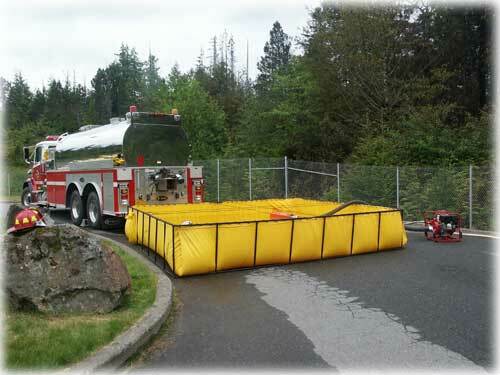 Tankers fill a water reservoir in order to keep a supply of water readily available.